Oubaai Golf Club is home to a Championship Golf Course designed by 3 times Major Championship Winner Ernie Els. 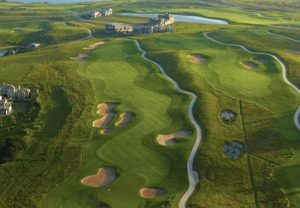 The course is a links layout where veld grasses line the lush fairways and greens. Being a coastal golf course, the elements and predominantly the wind play a role in the defences of the course. Oubaai is a course that will reward the well executed shot and penalize any wayward shots in the true time honoured tradition of a championship golf course. The course measures 6516 meters from the Pro tees. This is long for a coastal course, but the design and placement of tee boxes allow all levels of handicap golfer the opportunity to extract a respectable score given patience and good course management.